MIT Police Officer Sean A. Collier was fatally shot and killed Thursday night. Collier was shot on Vassar St. in his vehicle near the Stata Center (Bldg. 32) and Koch Institute for Cancer Research (Bldg. 76). He was 27 years old and a resident of Somerville. MIT Police Chief John DiFava, in a statement, described Collier as a dedicated officer who was extremely well liked by his colleagues and the MIT community. At approximately 10:20 p.m., police received reports of shots fired on the MIT campus, the Middlesex County District Attorney’s office said. At 10:30 p.m., Collier was found shot in his vehicle in the area of Vassar and Main streets. He was found with multiple gunshot wounds, and was transported to Massachusetts General Hospital and there pronounced deceased, the statement said. Boston Police announced at 9:45 p.m. on Friday that the second suspect in the Boston Marathon bombings, 19-year-old Dzhokhar A. Tsarnaev, had been taken into custody after an intense manhunt that lasted nearly 24 hours, ending the threat to public safety. 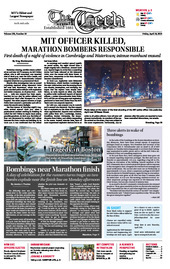 Yesterday evening, terrible events unfolded on and near MIT's campus. An MIT Police officer, who is still unnamed, was reported shot at 10:48 p.m. near the Stata Center, and was transported to Massachusetts General Hospital where he was pronounced dead. In the wake of the bombings at the Boston Marathon on Monday afternoon, there have been several reports of suspicious packages found on campus. Vice President and Secretary of the Corporation Kirk D. Kolenbrander sent an email to all of MIT campus on Tuesday instructing people to not leave their belongings unattended in public places and to call the MIT Police immediately if they see something suspicious.